A group of “Creation Scientists” are back in the news with their goal of proving the literal truth of the Biblical creation story. What they’re trying to do is not “news,” of course. It’s a decades old struggle of a fundamentalist, literalist faith against the truth of science. “…a group of nine Ph.D.s from places like Harvard and Los Alamos National Laboratory say all that molecules-to-man stuff is nonsense. And they’re out to prove it. I mean, dear God, even Pat Robertson has conceded that the world is older than 6,000 years, and that saying otherwise makes Christians look foolish. As a theologian, however, the primary point I bring to the conversation is this: Scientists can factually prove a lot of things, but they cannot factually prove faith. The opposite is also true. This is a not-so-insignificant point that both Creation Scientists and Atheistic Scientists gloss right over, all the time. 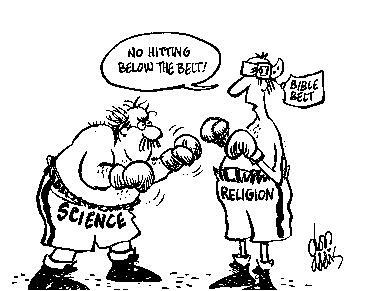 In their zeal to prove/disprove the literal account of the Bible, the “scientists”(1) on both sides of this debate miss a fundamental theological point. A God that can be “proven” factually is still not God. By definition, it must still be something less than God. The same thing is true in the converse. Any God that can be DISproved factually wasn’t God in the first place anyway, but something less than the One True God. What Fundamentalist Christian Scientists and Fundamentalist Atheist Scientists continue to debate, over and over, are facts. And facts are the realm of science. Their endless and pointless debate is all taking place within the relatively narrow confines of science. Faith is not faith if it’s just faith in facts. That’s science. And I’m not denigrating science here at all. I believe science. I just don’t “believe in” science, because science is not faith. But I believe science. I believe that what scientists say about the beginnings of time, about the mysterious work of evolution through time, I believe these things are factually true. And they are beautiful truths. By the way, in case you think this is some kind of newfangled, liberal way of looking at the compatibility of science and religion, think again. St. Augustine, writing in the 4th Century (read: 1600 years ago), basically said that it’s stupid for Christians to argue with the truths scientists discover, especially when we are not trained science. He saw no conflict at all between the two realms. But having said that scientific truths are beautiful, I must also quickly point out that they do not approach the realm of faith. Science can no more disprove the existence of God than it can disprove “love,” or “hope,” or “forgiveness.” All of these concepts belong to an entirely different realm. And science can speak about them. But science can neither prove nor disprove them. Any kind of “love” that science claims to have proven must by definition be less than true love. Any kind of God that science dis-proves must be less than God. Because faith is, by definition, a hope, a trust, a love of things not seen…things inherently not provable (factual). You see, this is the beef I have with the new TV show, “The Leftovers.” (Yes, I just yanked the steering wheel hard. Bear with me…) I love the show for the most part. But I think they’ve got the narrative about Christianity all wrong. The show assumes some future world in which there’s been a “rapture-like” event. Only it wasn’t a “Christian” rapture, or a “Biblical” one. Let me say it quite plainly for you here. There is no conceivable archeological, or scientific, discovery that could disprove my faith in God, or my belief in the Bible as “true.” (But not literal). Because I never have taken the Bible literally, the Bible cannot be taken from me. It’s not in conflict with science. It never has been. It never will be. The stories inside of it contain “truth” regardless of the literal facts of science. My faith is faith in God. Faith in faith itself. Faith in things I cannot see. Faith in things I cannot, nor can anyone, “prove.” Anything less than this is not faith. By the way, I happen to also believe that this is why so many folks “lose” their faith. Because the thing they were putting their faith in in the first place was something that could be taken from them. Anything faith that can be taken away is not faith in God, but faith in someone, or some-thing, else. No. Of course not. That’s preposterous. But that’s because literal, factual truth, and poetic truth are two different kinds of truth. Both are true. They’re just differently true. Analogizing this into theology, a God that can be prove OR disproven, factually, is not truly the One True God in the first place. So, to come back to where we began…. Fundamentalist Christians Scientists, like the folks in this story, will continue their endless and boring debate with Fundamentalist Atheist Scientists. But, whatever they prove, it won’t be faith. Endnote (1) I put “scientists” in quotes here, because a whole lot of scientists recoil at calling Christian Fundamentalist Scientists “scientists.” Because they start and end with the Bible, most other scientists claim that these folks have violated the tenets of the scientific method and don’t deserve to have the name. Be that as it may, these particular human beings are at the very least trained as scientists…some of them at the prestigious universities across the land. The “Fundamentalist Atheist Scientists” I am referring to are those who, wrongly, see their struggle as against religion itself, rather than for the beauty of scientific discovery. And, I also contend, some of them “believe in” science, rather than “believe” science. They raise science to the level of the theological, thus over-stating what science can actually do. Both these types of “scientists” are fundamentally confused about the role of both science and religion. There is also third, and entirely different group of scientists (and theologians) who see no conflict between the realms of science and the realms of religion. They understand the metaphorical truths that religion is seeking to speak to…truth, love, hope, faith…and that these things do not, necessarily, conflict with their scientific discovery.